This is ideal for a recumbent bike! So, I wonder: Would this be allowed? I kind of assume there is no rule forbidding it so: Why is not everyone doing this? Recumbents are a lot more comfortable for long distance and at least in the flat they are a lot faster, two. The TCR is a race (strictly speaking a time trial). In that specific case, Wikipedia states that recumbents and tandems are not allowed (no citation is given). I suspect that races will either say that or have a separate category (as is the case for the race across America. I can't find a definitive answer for the Race ACross Europe as the you appear to have to sign up to get the rule book, but I have found implications that they are allowed. For the more generic events in your title (of which there are many more), the case is likely to be more permissive. The TransOz (certificate error) for example, is run under Audax Australia rules, which state "A rider may ride any type of cycle on a ride provided it is only capable of being propelled solely by human effort and complies with the road rules*." Many such events (1200km and above) are listed by the Randonneurs Mondiaux. Wikipedia has a note of interest in the article on Ultra-distance cycling (the admittedly vague definition there includes much shorter rides than those in the question, right down to the sort of distances I ride). "There are no longer any true ultra-distance bike races (i.e., that are longer than 300 kilometres (190 mi)) that are affiliated with cycling's main governing body, the UCI" so we can't really blame the UCI directly for the lack of recumbents on such rides. The oldest ultra-distance cycling event (Paris-Brest-Paris definitely allows them. This isn't technically a race any more, but first place finisher is a prestigious position. * From other context on the site, this seems to be referring to local law for road usage, rather than, e.g., the UCI rules for road bike races (which would forbid recumbents). I don't see anything in the TCR that expressly forbids the use of recumbents but it would be worth reaching out to the organizers to make sure. There are endurance rides specifically for recumbent cycles, sometimes alongside sit-up bikes and sometimes 'bents only. 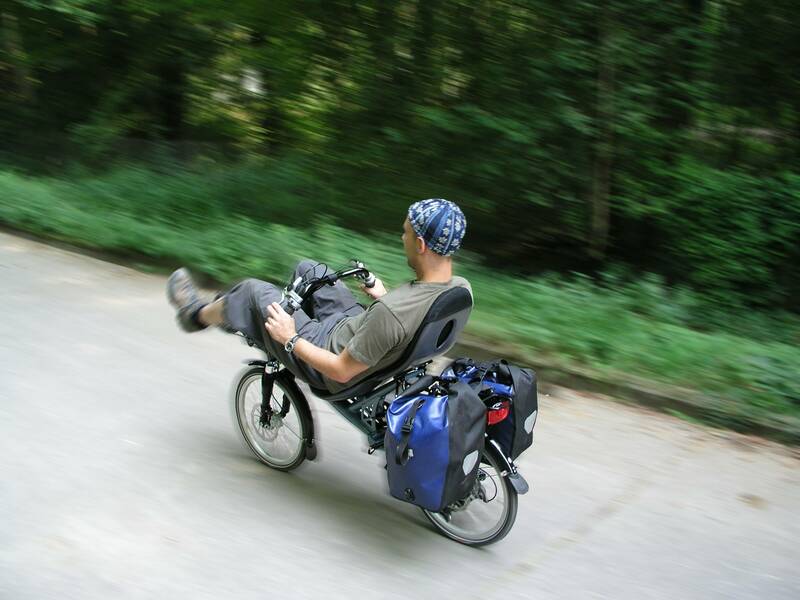 The recumbent cycles are mostly taking part in different categories. Fully faired (or enclosed,) tail fairing, no fairing at all. Some will also have different categories for bikes and trikes, children, seniors, new riders and whatever else they can think up to get more people joining in. To find the events you will need to search for recumbent races or long distance events or whatever, as long as you include recumbent or the local name for it. I have never joined in and only read about races in 'special bicycle' magazines and online, so I know they exist but I do not know many details. There are more links, some in Dutch, the ones I picked for here are random ones out of a search Paris-Brest-Paris Recumbent. If you know the name of other endurance events it is likely the best to search on those as well. As far as I understand recumbents were banned from races because they were too efficient on the flat and downward bits, giving the riders an advantage. But I also think that mixing bikes of different heights in close run busy groups is not really safe. Tandems and Recumbents and other out of class machines will not be classified on GC (General Classification) unless they allow a rider to compete on par with the efforts of other abled body riders where they would not normally be able to do so. Where registrations for the race exceed capacity riders we will not be able to accept riders who cannot be classified on GC. My understanding is that the TCR is always full. So Bents and tandems are out.